Now that the weather is cooling down, I am all about comfort foods. Beef brisket is not something I make often but I decided to mix it up for my last US Wellness Meats order and I am so, so happy I did. This recipe is unbelievably satisfying, full of flavor and tender as can be. 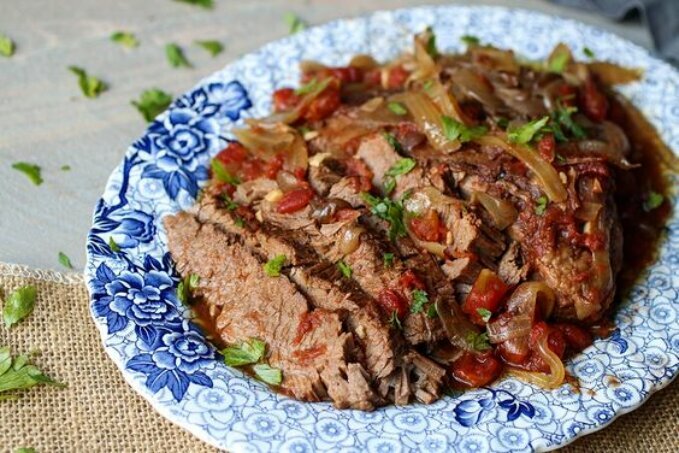 Slow cooked beef brisket brings back memories from my childhood as it was something my grandmother used to make on special occasions. 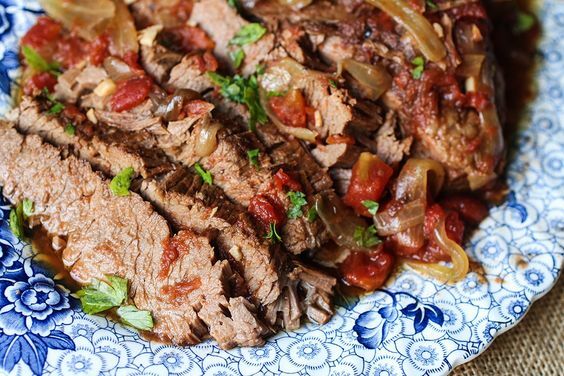 She made hers in the oven which is another great way to prepare brisket but I never pass up an opportunity to use my Instant Pot. So easy and virtually no cleanup! The other great thing about an Instant Pot is that after the brisket is finished cooking, it will keep it warm until you’re ready to eat it. So if you have to be at work all day you don’t have to worry about rushing home take anything out of the oven. It will be there warm and waiting for you when you get back! When selecting a brisket, make sure you are choosing something that is pastured, organic, or both. Non-pastured, non-organic meat has a completely different nutritional profile and is virtually an entirely different piece of meat. If you don’t have access to a wide range of high-quality meat near your home, US Wellness Meats is a fantastic option. I order in bulk and never have to worry about buying meat – it’s always in my freezer ready to defrost. Talk about easy meal prep! This recipe is fantastic served alongside garlic ghee mashed cauliflower or garlicky greens. Rinse beef brisket and pat dry. Grind both salt and pepper over both sides of the meat. Heat a skillet over medium high heat and add one tablespoon of olive oil. Once the oil is hot, sear the brisket on both sides until golden brown, about two minutes per side. In a separate pan, heat over medium heat and add remaining tablespoon of olive oil. 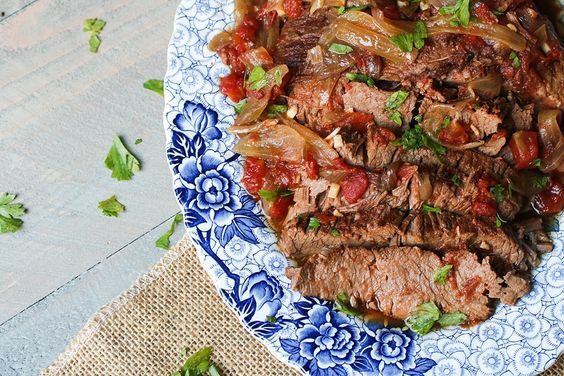 Add brisket, fatty side down into your slow cooker or Instant Pot. 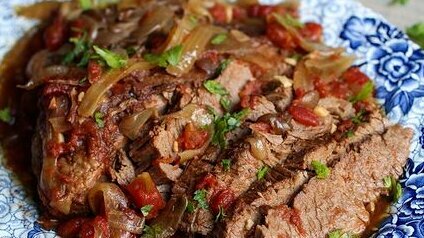 On top of the brisket, place the cooked onion, minced garlic, tomatoes, stock and add a bit more salt and pepper. 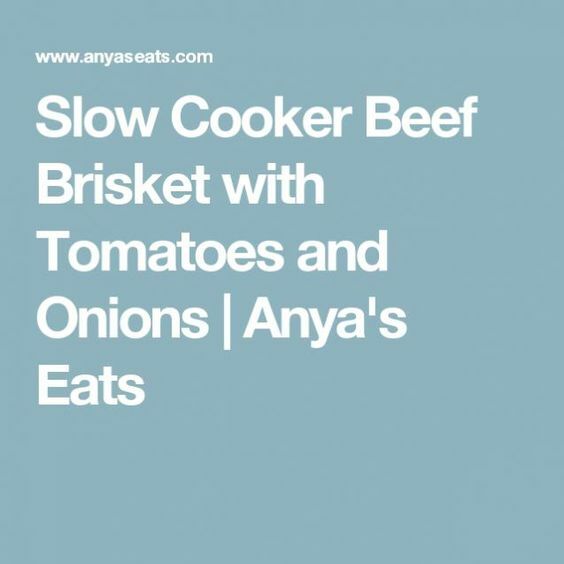 Cook on the slow cook setting in your Instant Pot for 6 hours. Cooking the meat for 6 hours will allow you to slice it for a nice presentation. If you like your meat more tender so that it falls apart, cook for 8 hours total. 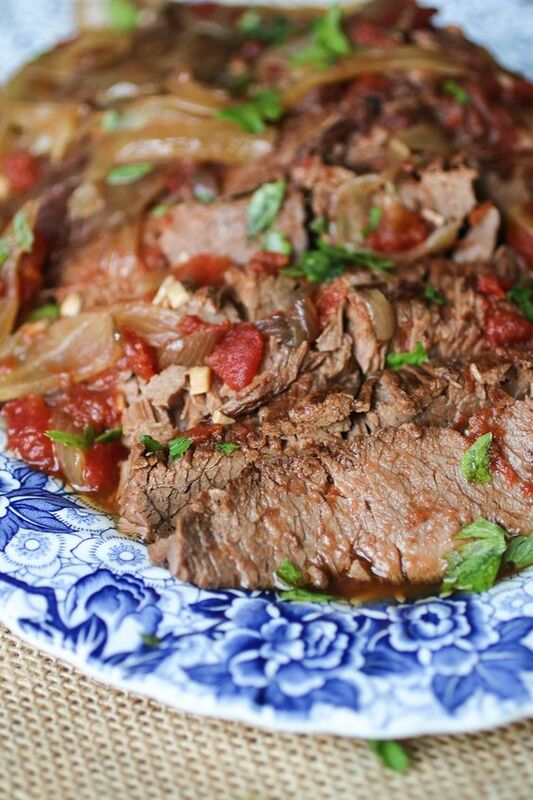 Just prepared this recipe and turned on slow cooker very excited for dinner! I used the Chuck roast instead. Same time suggested? Do you have a recommended temperature? Hi there. I’ve never tried it with a chuck roast but I would imagine the same cooking time would be fine! I do see carrots listed in the ingredients? Sorry I do not see carrots listed in the ingredients? Are they optional? There aren’t carrots in the recipe! This looks gorgeous – what would you suggest as cooking time for a brisket that is just under 2lb? I would probably still cook it for 6 hours. Maybe 4? You can’t really overcook it, so you should be good. Hope that helps! 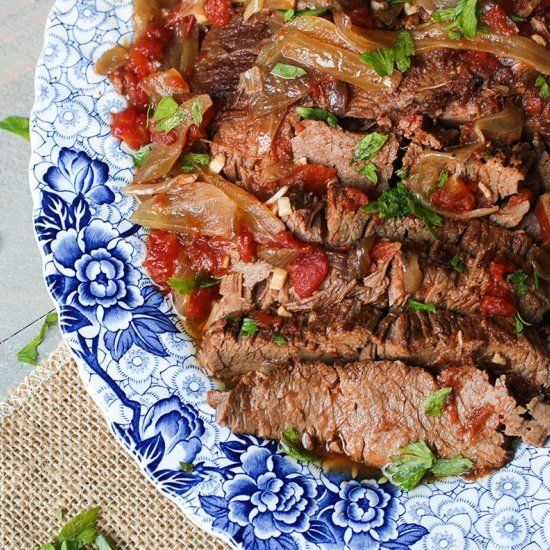 If cooking this in a slow cooker, rather than an Instant Pot, what’s the recommended setting – low or high? It should just be the regular slow cook setting, if that exists. If it’s just high and low, then low. Excellent – thank you for your prompt response. I look forward to trying this. I want to make sure that I understand correctly…the recipe calls for “1 head of garlic”. Does that mean the entire big bunch or just one clove (part)? Just wanting to make sure. Thanks for asking! Just edited this recipe and that was a mistake! Should be 6 cloves.